360 Labs is a production company specializing in 360º immersive panoramic photography and video based out of Portland Oregon. Our goal is to create meaningful and memorable experiences for virtual reality, desktop and mobile applications. As 360º cinematographers, we capture experiences in full 360x180 video for the explosive new VR medium. We strive for exceptional quality in the 360 medium, employing advanced panoramic photography techniques, stereoscopy, photogrammetry and gigapixel capture. We work to create truly customized experiences for each client, providing VR application development where a solid user experience is at forefront for every project. These are only a few of our favorite art forms, above all else we love to capture the world around us. If you're passionate about 360 like we are, we'd love to talk! Matt started his career as the creator of an award winning PC gaming community known as the Gamers’ Alliance - at more than 3 million monthly unique visitors, the company was acquired and he was hired by eUniverse, Inc. in 1999. He later continued his career as a web developer at one of Portland’s top digital agencies for 8 years, where he transitioned into the role of a digital media producer creating eLearning content for brands such as OHSU, Wells Fargo and A-dec. Yearning for more of a creative outlet, Matt left his agency gig to pursue freelance opportunities as a panoramic photographer and video producer, and would later co-found 360 Labs. With more than a decade of work exclusively in virtual reality (VR), Thomas Hayden helped pioneer the new medium of 360° video. The depth of experience he brings to each VR project from concept through production is part of our secret sauce at 360 Labs. Thomas has produced 360 projects for world class brands like GoPro, The Sierra Club, Google, Daimler, the United States Coast Guard, Nike, Columbia Sportswear, and many more. Thomas first learned to tell a story in the old way, around a campfire, as an expedition river guide on the Colorado Plateau. From Mexico to Alaska, wild places have long been his sanctuary, and access to them helped Thomas decide to put down roots in Portland, OR. Brad grew up in Georgia and has had a camera in his hand since he was a child; a Pentax 35mm borrowed from his dad. Brad decided to follow his creative passion and started shooting photography professionally in 2007. He finished his degree in Advertising Management at Portland State University in 2013. Brad focuses on quality work, superb customer service, and loves to stay organized. He stays sane by listening to music, playing his guitar, taking long walks with his camera, and enjoying time with his close friends. Forrest is a jack of many trades. He is experienced in all areas of post-production including editing, VFX, motion graphics, soundtrack composition and audio mastering. A graduate from Western State Colorado University, Forrest began working with video in 2010 and 360 production in 2016. Some of his favorite projects include filming Zombie Cats From Mars, teaching video production to high school students in Oregon and learning how to scuba dive for a 360 video in the Red Sea. Forrest enjoys creative collaborating, biking and traveling. Rachel specializes in documentary storytelling and holds a master's degree in multimedia journalism from the University of Oregon. She is a video producer with the award-winning Vanport Mosaic and directed the five-part series "The 26%: Women Speak Out on Tech's Diversity Crisis" for Recode. Her videos have been featured by the New York Times Magazine, Upworthy, NationSwell, and Oregon Public Broadcasting. She enjoys studying Japanese, watching cartoons, and living in Oregon where "the water is beer." 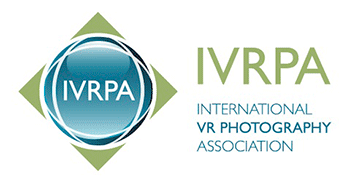 360 Labs is a proud member of the International VR Photography Association.